I quite fancied myself as a birthday party planner. But that changed as soon as I started organising my daughter’s first party. Rain was forecast so there was a last minute scramble to find an indoor venue. The cake collapsed, the entertainer cancelled and on the day I was running around like a headless chook putting out food and plastering a smile on my face, pretending that I was actually enjoying myself. It was a massive milestone for my first-born and all I wanted to do was run away! So since then, I’m hooked on outsourcing. I am addicted to parties where someone else does the stressing. They look after the food, the entertainment, the décor and I get to focus all my attention on the birthday child and our guests. And best of all, we don’t have to clean up at the end. So I nearly jumped out of my skin with excitement when I heard about Kidz Lounge. For years now, I have been taking my kids to the fabulous Art ‘n Move classes, which are held in various locations throughout Sydney. 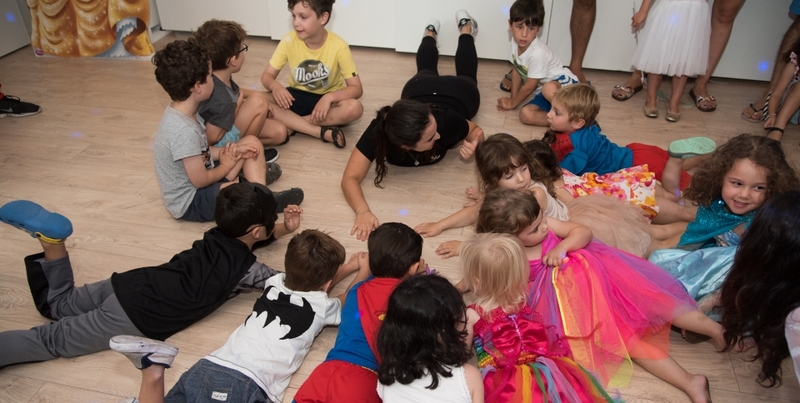 The brilliant team (Debbi Gomel and Jo Bailison) behind these creative classes had the idea to open up a brand new venue in the Eastern Suburbs to house a variety of exciting new kid’s activities, school holiday workshops and birthday parties. They custom-designed a property very centrally situated in Bondi Junction and created Kidz Lounge. So I booked in my daughters 4th birthday party at Kidz Lounge. From the very beginning, Debbi and Jo were so attentive. They organised an early meeting to discuss ideas and get a picture of what would be my daughter’s dream party. I loved that they provided a clean slate – there was no hint of a ‘cookie cutter’, one-size-fits-all attitude. They made it very clear from the outset that they can do whatever we wanted – be it an extravagant affair for 50 guests with all the trimmings or an intimate high tea with a handful of friends. On the day of the party, we arrived 15 minutes before the start! No heading to the venue hours before to set up – worth every cent already! Kidz Lounge had been transformed into a fantasy kingdom. There were princesses, Elsa and Anna from Frozen as well as Batman and Superman ready to welcome the kids. The disco ball was spinning, the bubble machine was bubbling and the Wiggles greatest hits was pumping out of the speakers. The kids got into party mode straight away, boogying away with glow sticks, fluorescent spectacles and other fun accessories handed out by the character hosts. Then it was game time and the hosts got the kids involved in a variety of fun party activities. Next up was a magic show and the children sat transfixed as the young magician pulled never-ending scarves from his sleeves. This led straight to snack time and the double doors adjoining the party room opened to reveal a spectacular table straight out of our dreams, set with an assortment of food and decorated with balloons. The kids feasted on fairy bread, fruit, sandwiches, crackers and crisps. The light-up waterbottles were a huge hit and the little guests were so excited to discover they could take these home. After the kids had eaten their full, the table was cleared and a craft activity was set up. This was a fantastic wind-down after the excitement of the meal. The kids also got to take home their completed craft as a post-party gift. Then it was cake time! We had chosen to bring our own cakes but Kidz Lounge can also organise the cake to be custom-made. Interestingly, the most popular cake was the Ben & Jerry’s ice-cream creation, gobbled up in minutes. I absolutely loved that for the full one and a half hours of party-time, the kids were kept engaged. There was not a moment to be bored or restless. The variety of activities moved swiftly along and at every opportunity, the three birthday kids were put on a pedestal, made to feel special and the centre of attention. Most important of all the birthday kids had the biggest grins throughout the whole morning. And so the celebrations came to an end. We said our goodbyes, thank-yous and walked out the door. What a pleasure! And the staff were already cleaning up and transforming the venue for the next party later that afternoon (there can be up to three events a day). I’m not surprised Kidz Lounge has taken off. It’s a fantastic venue with so much to offer and a super professional team are on hand to personalise your event into whatever you want it to be. No doubt about it, I’m booking already for next year!